For her persistence in fighting against the rise of violent extremism and radicalization of young people, Tunisian advocate and entrepreneur Ahlem Nasraoui, who in 2016 was one of ten winners of the first Emerging Young Leaders Awards from the U.S. Department of State, and in 2017 was nominated for the United Nations’ intercultural innovation award, has been selected as one of forty Peace Ambassadors to attend the One Young World Summit 2018. The One Young World Peace Ambassadors Programme is a European Commission initiative launched in 2017 to promote and accelerate young leaders in preventing and countering violent extremism (P/CVE), peace-building efforts and conflict resolution. The summit will take place in The Hague, the Netherlands, from 17 to 20 October 2018. One of the International Civil Society Action Network (ICAN)’s partners, the 26-year-old has launched numerous initiatives under the umbrella of the Young Leaders Entrepreneurs in Tunisia. One such initiative would be the Unleash Tunisia Venture Bus, a hop on and off which toured the country with the aim of spreading peace education and entrepreneurship among vulnerable youth in remote areas. The bus provided economic empowerment by pushing youth at the brink of extremism to start their own entrepreneurial projects. Peace Lab, another project Nasraoui launched, was the first educational incubator to teach civic engagement, peacebuilding and reconciliation in Tunisian schools. Organized in the four most affected regions by radical thought and lack of proper education, schools in Kasserine, Sidi Bouzid, Sejnane and Mednine got curricula that engage youth with capacity building for conflict transformation and conflict resolution, as well as how to become critical thinkers over manipulator tools of communication that incite and accentuate the propaganda of violence. “As a young peace advocate and PVE activist, I consider such events as excellent platforms for youth to contribute on how to tailor effective solutions and policies in nexus with the economy, entrepreneurship, youth, gender and minorities,” said Nasraoui. “Humanizing policies and sharing world views will enable us to have a pragmatic approach to how we tackle reconciliation, forgiveness and tolerance holistically because peace should not be processed as a fragmented piece in a given agenda but rather as a whole where the multi-lenses of faith, history, gender, religion, economy, politics, identity and other factors are recognized and considered in tailoring effective solutions for violent extremism and terrorism,” Nasraoui said. 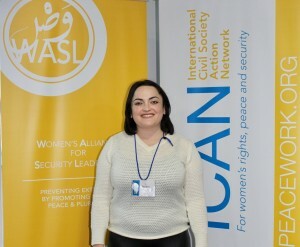 Nasraoui is also a member of the global Women’s Alliance for Security Leadership (WASL) that ICAN spearheads. The alliance brings together existing women rights and peace practitioners, organizations, and networks actively engaged in preventing extremism and promoting peace, rights and pluralism, to enable their systematic and strategic collaboration. “I am so grateful for WASL as it equipped me with knowledge and expertise on how to access such events and networks for the betterment of our communities and the establishment of vibrant initiatives that are rooted in the local and yet reaches the international to spread the values and principles of resilience, empowerment and enablement of local communities as drivers of peace and sustainable development,” Nasraoui said. The One Young World Peace Ambassadors Programme brings together peace, human rights and P/CVE activists from around the globe. According to Nasraoui, prior speakers at the One Young World Summit included high-level figures like Kofi Annan, Justin Trudeau, Mohammed Yunus, and Emma Watson. The event also gives the youth an opportunity to talk directly with the EU’s representatives and policy makers. As an advocate for peace and diversity, Nasraoui believes that such events, networks and occasions will bridge understanding on how those involved can succeed in internalizing the rooted communal knowledge and grassroots-based initiatives for sustainable peace and holistic policies amidst “the cacophony of global institutions’ war on terrorism”. “I believe that my message at the One Young World Summit will be about the importance of trusting youth and women in the peacebuilding process and bringing the local context to the light by shifting the paradigm and empowering such constituents and stakeholders,” she said, adding, “we often encounter dismissal of youth or women’s voices because we think of them as troublemakers and victims. It is true that they are the first to be affected in war and conflict zones but we should see them as well as change makers and drivers of change”. Congratulations to Tunisian women running for Parliament!